There is no other day like it around the world – SuperSunday at the Superkarts! USA SuperNationals. 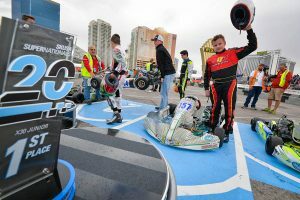 For the 20th time, drivers from around the world took part in the premier event of the organization, taking part in the final day of action at the Las Vegas Convention Center. Ten different categories battled since Wednesday, with drivers vying for a chance to make history and place themselves in the record books. A brief rain shower was the only diminish on the day as the 20th SuperNationals winners and 2016 SKUSA Pro Tour champions were decided. For complete coverage visit the EKN Event Page. 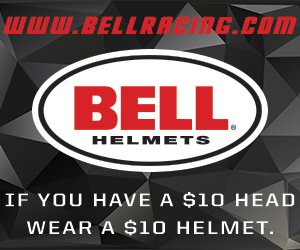 Since the days of Scott Speed, no driver had ever repeated as the victor in the S1 Pro Stock Honda division. The record books will now show Danny Formal as the second driver to do so, along with earning the highest payday in SuperNationals history with a $26,000 payday with victory on SuperSunday. The DRT Racing / DR Kart driver started outside row one, and grabbed the holeshot over polesitter Jake French (Sodi Kart), who fell back to sixth. TB Kart USA driver AJ Myers jumped up to the second position as the two Florida native drivers showed the way. French fought his way back up to the third position by the halfway point, trailing by just over two seconds. Formal and Myers continued to lead the way as French closed in lap after lap. Formal continued a consistent pace aboard his DR Kart, keeping Myers at bay, who in turn was able to keep French back in the closing laps. At the line, Formal led all 25 laps to become the first repeat winner of the modern S1 category, securing the SKUSA Pro Tour championship and taking home over $26,000 in race and championship prizes. Myers settled for the second spot with French in third. Kiwi drivers Daniel Bray (GP) and Matt Hamilton (Aluminos) completed the top-five. Jake Craig finished his S1 debut with a sixth place performance, besting California PKC champion Billy Musgrave (Aluminos). Champion Racing / Intrepid driver Nick Neri improved to eighth from 14th, brining Christian Schureman (Mach 1) with him while 2013 winner and champion Joey Wimsett ended an up and down week with a 10th. The X30 Senior main event was another historic race put into the books on SuperSunday, featuring the 14th different winner. KartSport North America / Praga driver Brandon Jarsocrak and factory Ricciardo Kart driver Marijn Kremers led the field to the green flag with a clean start through the opening corners until reaching turn two, when the typical bumper to bumper bouncing around took place to ruin a few drivers opportunities to battle for a podium run. Jarsocrak retained the lead for the opening lap with Canadian Zach Claman DeMelo (Intrepid) taking over. Kremers eventually found his way to the point, only to ruin his shot at victory by making contact with the barrier outside turn 11, watching the remainder of the race on lap eight. This promoted Jarsocrak back to the lead until he was shuffled back to fifth on lap 10 with DeMelo taking over the position and SKUSA #2 plate holder Jake Craig (Tony Kart) into the second spot. Craig stalked the IndyLights driver until the final lap, making a move at turn 10 with a little push from behind by 2010 winner Andre Nicastro (Italkart). That bump pushed him through to the lead and down the straight, the top-four jostled for position. Craig was able to fend off the challenge, and cross the line for his first SuperNationals victory. DeMelo crossed the line to finish second with Joshua Car (CompKart) completing a great drive from 14th to third, working past Nicastro at the end. 2014 winner Marco Meastranzi (Top Kart) drove to fifth with Christian Brooks (Tony Kart) in sixth. Jorge Pescador (Praga) advance 10 spots to seventh with SKUSA Pro Tour champion Ryan Norberg (Tony Kart) making up 13 positions to eighth. Stepanova Nekeel (Tony Kart) fell to ninth after starting fifth while Zach Holden (Tony Kart) was the top rookie finisher to complete the top-10. Another $20,000 bounty was claimed on the day with 2014 SuperNationals winner Paolo de Conto dominating the KZ main event. Recovering from a poor qualifying effort, the current world champion showed the speed to be the best throughout the heat races. 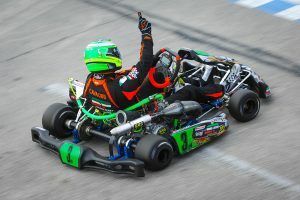 Starting alongside Sodi Kart driver Anthony Abbasse, the CRG factory pilot took over the lead on lap two. Racing for the second spot behind him, de Conto established a solid lead early and continued to drop fast lap after fast lap. 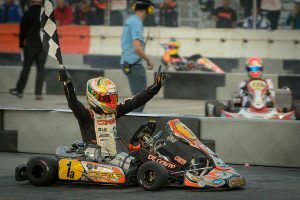 At the end of the 25-lap event under the bright lights of Las Vegas, de Conto and CRG Nordam secured the victory by six-seconds. The fight for second saw American and defending winner Gary Carlton pressuring Abbasse right after de Conto went through. Knowing he needed to get into second to challenge for the win, Carlton tried a move going into turn two, only to have Abbasse close the door. Another attempt the following circuit on lap four resulted in the two drivers coming together, with Carlton going up and over Abbasse and into the barriers. The Formula K driver restarted, but lost his chance at a repeat victory. That promoted Bas Lammers into the second spot with Abbasse falling to third. 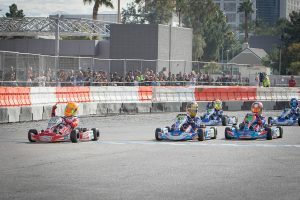 The two Sodi Kart teammates worked together to get away from the rest of the field as Abbasse would claim the second position at the checkered flag and Lammers third. Jonathan Thonon drove up to fourth in his GP debut as Lorenzo Camplese (Parolin) completed the all international podium. Danny Formal (DR Kart) was sixth with Canadian Phillip Orcic (Mach 1) up to seventh. AJ Myers (TB Kart) was the top American in eight ahead of Matteo Vigano (Top Kart) and Christian Schuremen (Mach 1). A similar performance was put in by rookie Mathias Ramirez in the S2 Semi-Pro Stock Honda division. Starting on the pole position, the Andersen Racing / Birel ART pilot slipped back to third with last year’s runner-up Austin Wilkins (Sodi Kart) up into the lead and top qualifier Rory van der Steur (FA Kart) following through. Ramirez settled in, and worked past van der Steur and then Wilkins for the lead by lap four, and began to pull away. Ramirez led the remaining laps of the 20-lap event to secure his first ever SuperNationals victory. Behind him, it was a battle for the second position with Wilkins able to hold off a charging Collin Daley (DR Kart) for the runner-up position. 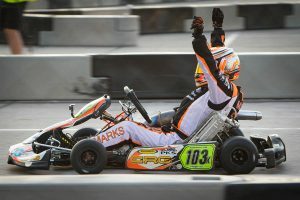 The effort awarded Wilkins with the SKUSA Pro Tour championship. Fourth was van der Steur with Hunter Pickett (Aluminos) coming from 14th to land himself on the podium. A great drive was put him by former S5 champ Trenton Estep (Sodi Kart), advancing 26 positions to end up sixth. There was no better starting position than on the pole for three-time winner Bonnier Moulton to secure a record-breaking fourth SuperNationals title. Moulton (Tony Kart) was able to grab the holeshot to begin the S4 Master Stock Honda main event with the field shuffling in behind him. The early driver on the charge was Antonio Perez (GP), coming up from fourth to take over the lead on lap four. A long line of drivers made up the lead group, including championship contender Ryan Kinnear. The Champion Racing / Intrepid driver com on mid-way through the race, advancing himself up to the lead by lap 11. Moulton began to struggle, and eventually fell back after drifting wide at turn 12. GP drivers Perez and 2014 SKUSA Pro Tour champion Gian Cavaciuti worked together to drop Kinnear down to third, trigger some jostling for position. Lap 19, fighting for position lead to a number of contenders making contact and blasting into the barriers at the esses, including Rob Logan (CRG), former winner Jimmy McNeil (CRG) and Trevor McAlister (Sodi Kart). Up front, Cavaciuti was able to hold off Perez for his second SuperNationals victory, giving GP a 1-2 finish. The championship went to third place finisher Kinnear. The contact leading up to the white flag helped to promote Chris Jennings (DR Kart) to fourth for another SuperNationals podium and Jordon Musser (Intrepid) to fifth. The X30 Master victor was decide on and off the track after the 20-lap battle. The race began with a major pileup at the start, including defending champion Nick Tucker (Fullerton) among many others in turn two. 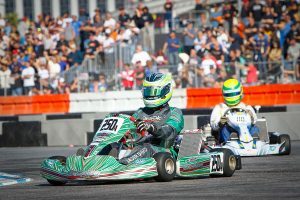 The lead drivers established their positions early with Renato David (Tony Kart) coming from third to first early, leading polesitter Kris Walton (CompKart) and Eduardo Dieter (Italkart). They stayed that way until the closing laps when Walton pressured David for the lead. Contact at turn seven put Dieter into the lead and dropped Walton down to sixth. Dieter crossed the line first, however, officials place him behind Walton for the contact. That promoted David to the top step of the podium for his first SuperNationals victory. Three-time winner Leonardo Nienkotter (CompKart) slipped through to finish second, giving Brazil a 1-2 result. 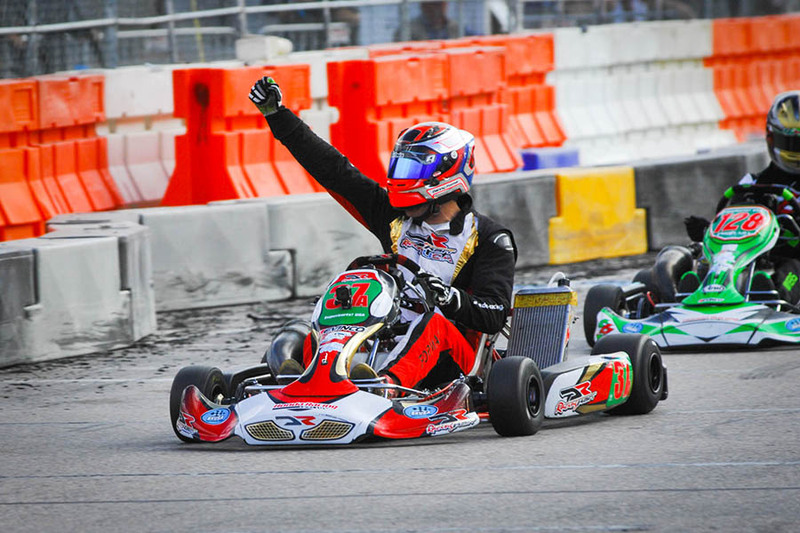 Derek Wang (FA Kart) climbed three spots to third, securing the SKUSA Pro Tour championship. Two-time defending winner Kip Foster (Arrow) advanced 10 spots to fourth while Adam Kasick (Tony Kart) completed the top-five. Walton finished in the sixth spot dropping Dieter to seventh in the final classification. Robert Marks became the first ever S4 Super Master Stock Honda SuperNationals winner and SKUSA Pro Tour champion. The CRG driver jumped out to the lead from the pole position, joined by championship rival Nick Firestone (DR Kart) and John Crow (Praga). Crow ran second for much of the race, with Firestone working past with just three laps remaining. The DRT Racing driver made a late charge at Marks, unable to attempt a pass. Marks crossed the line first to earn the victory and title ahead of Firestone and Crow. Patrick O’Neill (CRG) secured the fourth position with Rod Clinard (CRG) climbing from 10th to fifth to stand on the first ever S4 Super Master podium. The X30 Junior category opened up SuperSunday with their 20-lap event. Five drivers broke away from the field with Tyler Gonzalez (Tony Kart) putting himself up to the point ahead of polesitter Arthur Leist (Kosmic) and championship contender Alex Bertagnoli (Merlin). He along with Zoey Edenholm (Tony Kart) and Dante Yu (CompKart) were all separated by just 11 points heading into the race. Edenholm had her title chanced dashed quickly, pushed back deep into the field on the opening lap. This put Bertagnoli into the driver’s seat for the title as he fought for position at the front. He led briefly late until Gonzalez reclaimed the top spot, helping to put CompKart teammates Nicholas d’Orlando and Yu into the challenge. Prior to receiving the white flag, a brief sprinkle of rain dusted the track, making the circuit slick for the Junior drivers. A number of karts slid into the barriers at the end of the long straight, including Yu and others. The rest of the field limped around the course for the final lap, with Ocala Gran Prix pilot Gonzalez crossing the line as the victor. Double SummerNationals winner Dylan Tavella (Tony Kart) advanced up to the second spot, jumping ahead of d’Orlando. 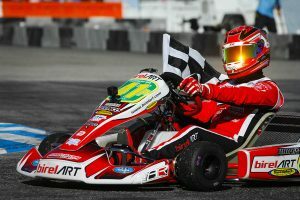 Bertagnoli came across the line in fourth, helping him to secure the SKUSA Pro Tour championship. 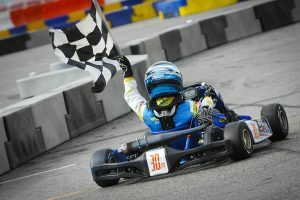 Oliver Calvo (Top Kart) completed the podium in a wild finish. It appeared to be Reece Gold’s race to win, starting on the pole position of the Mini Swift main event and pulling out to a solid lead. Lap five, Gold was caught and began falling down the order, eventually finishing 15th. The fight for the lead went over to Jak Crawford (Energy), Rafael Camara (Benik), Joseph Taylor (Benik) and Luca Mars (Energy). Each took a turn at the point, leading up to the final lap. They all jostled for position on the final circuit. Contact in turn seven changed the complexion of the order, helping to bring in 10th place starter Thomas Nepveu (Birel ART). A drag race down the long straight was won by Nepveu, going from fifth to first on the final circuit to cross the line first ahead of Taylor by 66 thousandths of a second. Mars crossed third with Carson Morgan (Benik) up to fourth and Tyler Maxson (Benik) in fifth. For Maxson, he went into the main event fighting with Diego LaRoque (Benik) for the title. At one time, LaRoque was the provisional title leader, however, Maxson’s performance helped him to earn the SKUSA Pro Tour title. The Micro Swift main event followed X30 Junior, and after a delay waiting for the small rain to pass through, the karts hit the track with another dusting of precipitation falling from the sky as they took the green flag. It lasted just a few minutes, however, the damage was done as a number of the kids spun in the opening corner after the green flag. Up front, polesitter Vinicius Tessaro (Benik) was joined by Freddie Slater (Benik) at the front. Slater led early until Tessaro took over. They ran nose to tail until the final two laps. Tessaro was able to claim the top spot on the final, crossing the line to earn the inaugural Micro Swift SuperNationals victory. Slater settled for second while Kai Sorensen (Praga) fought back after dropping to eighth to finish third. 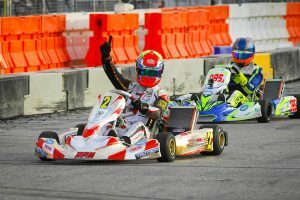 The Leading Edge Motorsports driver secured the SKUSA Pro Tour championship, becoming the inaugural title winner. Nikita Johnson (FA Kart) was fourth with Brandon Carr (Benik) in fifth – placing second in the Pro Tour standings while Elliot Cox (Benik) advanced 17 spots to sixth, earning the third step of the championship podium.